Frequency modulation (FM) sent data over a carrier wave by varying its instantaneous frequency in telecommunications and signal processing. This is in contrast with amplitude modulation. The amplitude of the carrier is varied when its frequency remains constant. In analog applications, the difference between the instantaneous and the base frequency of the carrier is directly proportional to the instantaneous value of the input signal amplitude.The digital data can be sent by shifting the carrier's frequency among a set of discrete values,the technique known as frequency-shift keying. Frequency modulation can be known as phase modulation where the carrier phase modulation is the time integral of the FM modulating signal. FM is widely used for broadcasting of music and speech, and in two difference way radio systems, in magnetic tape recording systems, and certain video transmission systems for example, in radio systems, frequency modulation with sufficient bandwidth provides an advantage in avoide naturally-occurring noise. Frequency-shift keying (digital FM) is widely used in data and fax modems. • Assistive listening devices (ALDs) include a large variety of devices designed to improve audibility in specific listening situations. Some are designed to be used with hearing aids or cochlear implants, while others are designed to be used alone. • While there are a combine variety of microphones, pickups, headphones and earphones, that comprise assistive listening devices, they all have the same goal to emphasize the signal that you are interested in. • That signal might be a faraway voice (e.g. A lecturer in an auditorium), or a relatively near signal that missing in other noise (e.g. Listening to TV while others are talking nearby). • It can usually amplify a signal, but their primary purpose is not to make a signal louder. They place a pickup (microphone) close to the sound source, so that it becomes louder compared to the other sounds in the environment. • Assistive listening devices improve user ability to hear because they make the desired sound stand out from the background noise. 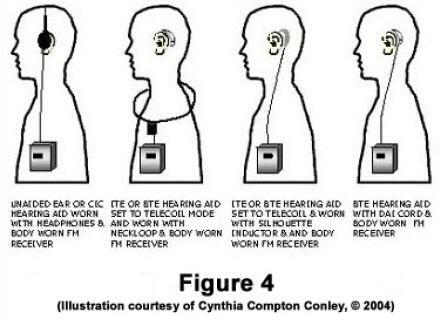 An ALD brings sounds to the ears of the person who wear the device so that he can hear well. Usually this device is use for children so that they can hear their parent talk clearly. Two of the most common ALDs are FM systems and Sound Field Systems. They help by cutting down on background noise. They also make faraway sounds seem closer and help your in hear in a large room, like an auditorium or a stadium. The FM system works when as we talk into the microphone and then sends the sound of the voice to the ears who wear it. An FM system has three parts that is a microphone, transmitter and a receiver. The device works as a sound enter the microphone. The microphone can be used by one person, like a parent or teacher. You can also set up a microphone in the middle of a small group. The microphone will pick up their voices and send them to it clearly to the ear. The microphone is connected to a transmitter. The transmitter sends the sounds to a receiver. The receiver gets the sound and plays them back into the ear. It can be used with or without a hearing aid. If the person is getting a hearing aid, make sure that it can be hooked up to an FM device. If the person did not use a hearing aid, get a head set that will hold the receiver close to the person ear. This FM system could be use by all persons of ages. This FM system may also be helpful if you had a unilateral hearing loss. A unilateral hearing loss is a hearing loss in only one ear. The device would probably be used in the better ear. The FM system can be use at home and outside the home. For children, the FM system can help them hear you better when you're talking to him. The FM system also can help them hear the teacher clearly. Beside that the FM system works even if the teacher is far away, or if there is other noise in the classroom. The FM system can be use when shopping or on outings away from home. You may also use the microphone yourself. This way it can hear you own voice better and learn how to speak more clearly. There are different kinds of microphones for FM system that is lapel microphone, boom microphone and handi microphone. A lapel microphone is a kind of mic clips onto your shirt or jacket. It is also called a lavalier microphone. A boom microphone is worn on a headset. The headset keeps the mic at a certain distance from your mouth. A handi microphone has different settings. One setting lets it pick up the voices of several people in different parts of the room. Another setting may let you pick up the sound of a speaker in one direction. The handi microphone can also be passed around to different speakers. • Wireless systems include of a transmitter and a receiver. The transmitter picks up the sound ,then transmitter also can be placed directly into the jack of a home entertainment system, computer,telephone, or other device. • The desired signal is sent from the transmitter to the receiver through radio waves. As a example, a tiny FM receiver, tuned to the same frequency as the FM transmitter, plugs into the listener's behind-the-ear (BTE) hearing aid using a DAI connection. The tiny "BTE FM" receiver picks up the transmitted FM signal and delivers it to the hearing place. • Thus, the transmitter and receiver form a wireless link from the sound source to the listener. • Body worn styles of FM receivers are also available for use with all hearing aid styles. With a mild hearing loss, the hearing aids can be removed and the FM receiver can be used with earphones. If the listener uses CIC style hearing aids, it may also be possible to place earphones over th ears and hearing aids. Inductive coupling also may be used with ITC, ITE or BTE hearing aids set to telecoil mode. • Finally, BTE hearing aids may be coupled to a body worn FM receiver using inductive coupling or a DAI. Base on our research, we can conclude that the FM system can make a person hear better. 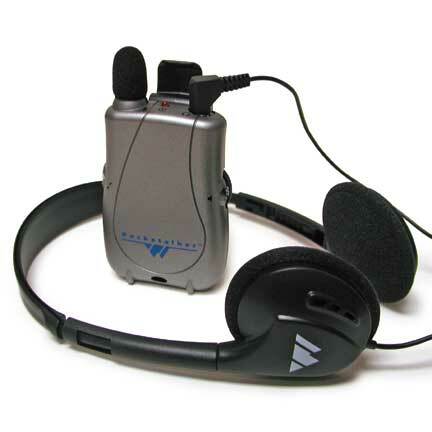 Anyone with some amount of residual hearing can benefit from an assistive listening device. A person who is able to converse one-on-one in a quiet room without lip reading would get a lot of benefit from assistive listening devices because a properly used ALD can duplicate the quality of sound. People with less residual hearing will benefit from the use of an assistive listening device, because the device will provide extra lip reading clues.